Foxes are sometimes regarded as a cross between a cat and a dog. Obviously dog-like in much of their appearance and behaviour, their call is something of a cross between cat and dog, their grooming is much more cat-like; but perhaps the most obvious feline behaviour is when it comes to climbing. If a cat can get on it or over it, so can a fox. 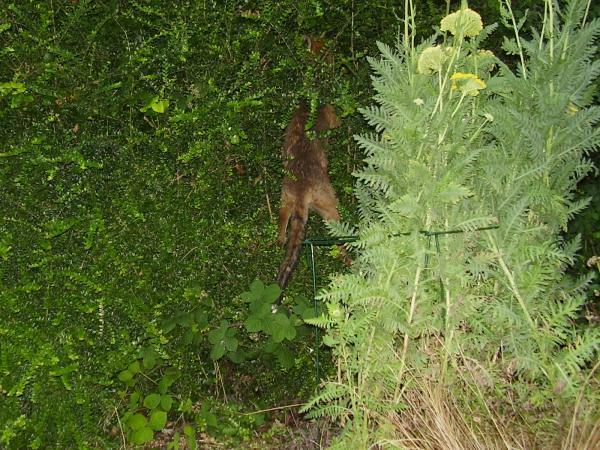 This image shows one of our foxes (again around 2006) attempting to climb the hedge along the boundary of the garden. There’s also a longer hedge climbing sequence from 2008 in the photo galleries. 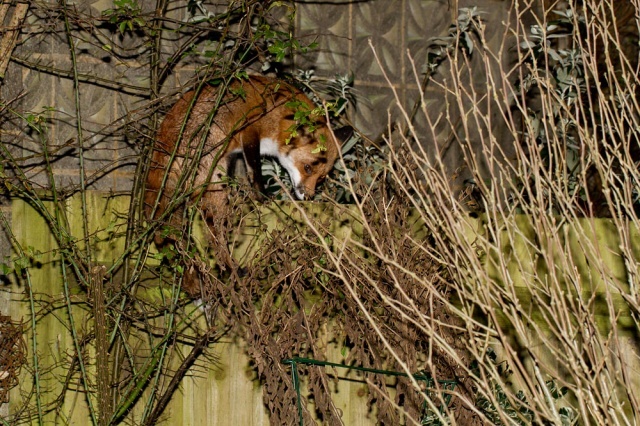 This, from 2011, shows a fox climbing over a 4′ 6″” fence on the other side of the garden. I included a longer “fox climbing fence” sequence in post from 2007. They are also perfectly at home on rooftops. 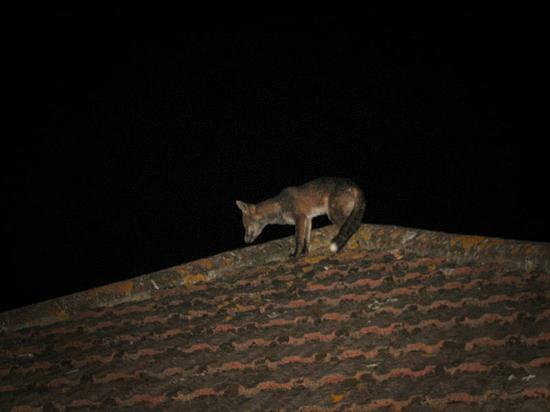 In the first photo the fox is an adult male who scaled the roof to avoid the persistent attention of a group of boisterous young fox cubs! 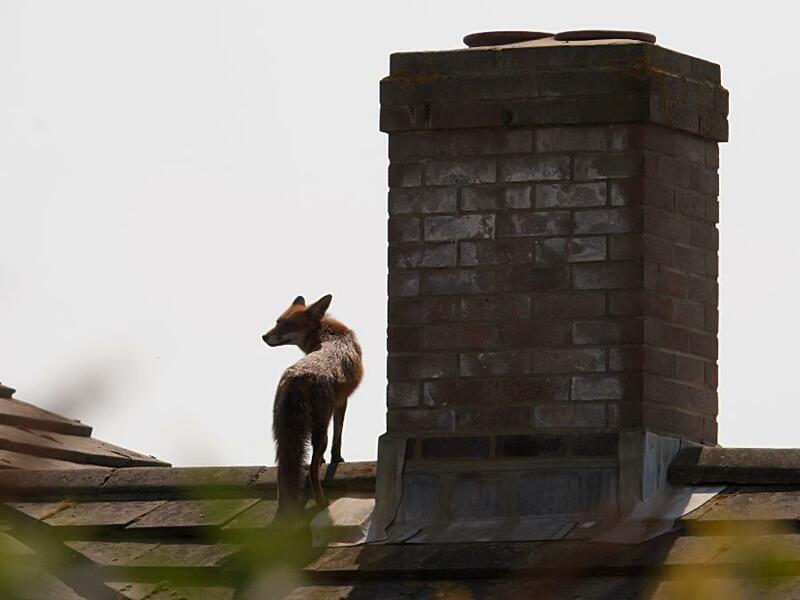 This photo is one of many I took of a fox we named ‘Roofy’ due to his regular rooftop exploits, only occasionally being harassed by the local herring gulls! The most extraordinary climbing event though is when a fox decides to climb a tree. Our garden is fringed by a number of small beech trees. I’ve seen cats climb the trees, and wood mice are adept at getting to bird feeders, but nothing quite prepared me for seeing a fox scrambling through the branches as it searched for wood pigeon eggs. Over the years I’ve seen two different foxes do this. They lack the suppleness of cats and therefore are more cautious about how they move about, testing branches to see if they’ll take their weight and spending a good deal of time working out a safe route. It’s not elegant, and the last part of the descent can be an ungainly fall. 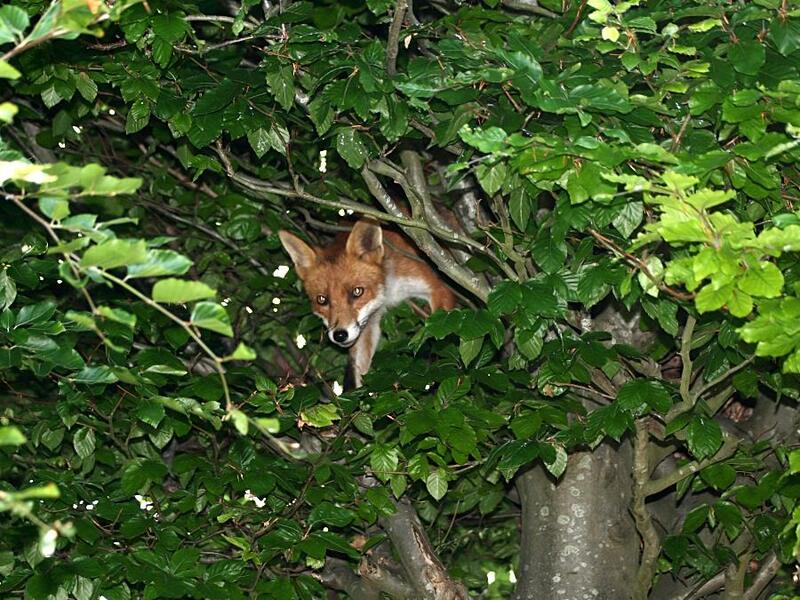 Here’s a video sequence (taken in 2007) which gives a good idea of the difficulties faced by tree-climbing foxes. As a side-note to climbing, one of the most common injuries foxes get are to their legs. Strains, sprains and breaks. Just about every fox we’ve watched has spent some amount of time carrying a limp, though they have all recovered without intervention. 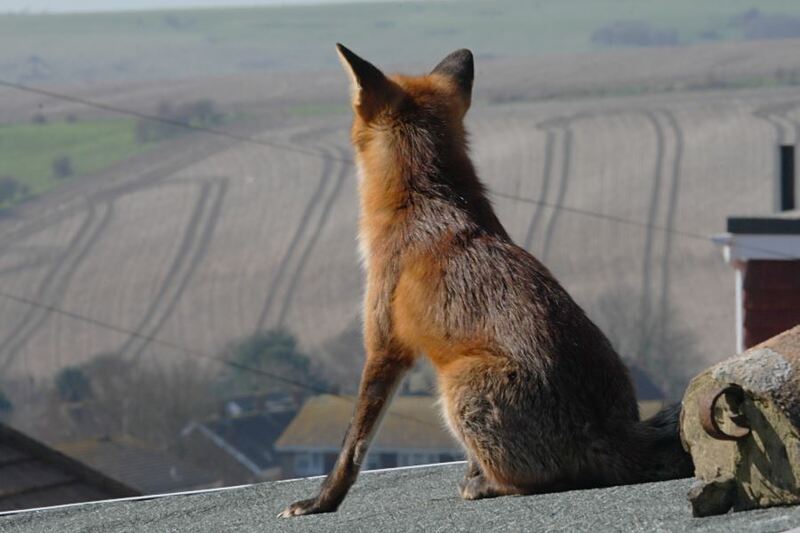 It’s little wonder given their propensity to scale heights that injuries occur, and research by Professor Stephen Harris suggests that some 70% of foxes who survive to 5 years have one or more healed breaks (source: Urban Foxes, Stephen Harris and Phil Baker, Whittet Books, 2006).